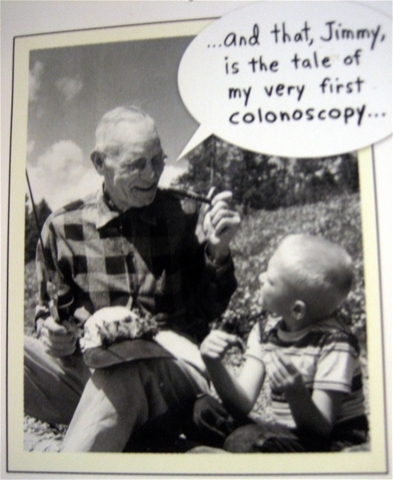 Not much rhymes with colonoscopy…. I really tried, too. But colonoscopy is not a word that easily rhymes. Thought I’d write some funny little ditty, to help you feel some pity…. Well, then, as I begin a tale about my tail, let me lay the groundwork. So, anyway, it was a big day for me: I needed to get my driver’s license renewed, and I needed to get my photo made. So I dressed in a GOOD color for me, got my hair done, and waltzed into the DMV, Express Lane. The girl who was taking my picture said, “Oh, that’s a nice photo!” and I said, “Yeah, and it’s my 50th birthday, too!” And of course, the poor woman had no choice but to oooh and aaah over how young I looked. So I walked out of there with a spring in my step, and off I went to my doctor’s office. I pulled the same thing on several other people, who all also, agreeably, complied with my request for vain assurances that I really didn’t look “that” old. And then, enter my blue eyed doctor, whom I adore. “Really??? ?” he beamed. “Your birthday? Well, I have a little present for you!” I dimpled in what I hoped was a fetching manner. “You DO??? ?” By this time, the hook was firmly set in my jaw. “What is it???!!! !” I asked my wonderful, generous doctor-friend. “It’s called a ‘colonoscopy'” he smirked. Honestly, the nerve of some men. He USED to be my favorite doctor. We had no money. We have a high deductible. I had no time. I didn’t WANNA. So, like many of you have done, I put it off. Flash forward a year and a half. Last month, I got the word from one of my siblings, who shall go unnamed, that a cancerous polyp had been found in (and was then successfully removed from) his/her colon. And, this sibling gently and lovingly warned me, that if I knew what was good for me…. Well, cancer in a family member certainly perks up your attention level. And, this year, I HAVE met my deductible. And so, I got busy and scheduled the darn thing. 1. For cryin’ out loud, just do it. It really ain’t that big a thing. And I’m a great big weenie in regard to fear. But honestly, if I can do it, so can you. 2. It’s just like you’ve heard: the prep is the worst part. But in regard to that, they’ve made some significant advances, which leads to #3. 3. Ask for Miralax for your prep. Mix it with SmartWater (electrolytes, dontchaknow) or Gatorade. Drinking an entire gallon, 8 0z. every 10 minutes, really was the worst part. But it’s doable. I understand that the “old” stuff: GoLytely, it’s called – now, THERE’S a misnomer if ever there was one – is terrible, terrible stuff. 4. Buy some baby wipes that are unscented. Try to blot, and not wipe. Your bottom will thank you several hours into your Southerly Evacuation Procedure. IT IS IMPERATIVE THAT YOUR SIGNIFICANT OTHER/ROOMMATE/DRIVER NOT GET A STOMACH BUG AND COMPETE WITH YOU FOR BATHROOM PRIVILEGES THE NIGHT OF YOUR PREP, ESPECIALLY AT 3:00AM WHEN THE CONTENTS OF YOUR BOWELS HAVE TURNED INTO WATER. I cannot emphasize this last point strongly enough. Because, first off, by scheduling the colonoscopy, well, aren’t you being the Brave Little Toaster? Don’t you deserve LOTS and LOTS of sympathy and pampering and hand-holding (as long as you’ve washed them after every bathroom visit)? And if your dear spouse is lying in the bed next to you moaning and groaning and clutching his own guts, well, it kinda steals your thunder a little bit. But let’s face it: that night? We EACH had plenty of surplus thunder to steal. After losing the 100 ft Diarrhea Dash for the upstairs porcelain throne, I decided to sleep downstairs on the living room couch, just to avoid any more competitive events that long night. Pilgrim, my German Shepherd had followed me down the steps, so she lay on the rug in the living room, her tall, pointy alert ears coming up every time they detected another whale song emitted from my rumbly tumbly. Deep, crying out to deep. Wow, it was loud. Oh, by the way: did I mention? I’m all clean!!! Praise the Lord and pass the cheese!